The Provincial House of 1868 with an arch under which the road passes Elorrio, is an emblem of the town. Locality with deeply rooted cultural tradition, known throughout Europe in the 18th century for its “Real Seminario Patriótico Bascongado”, in whose facilities the metal tungsten was first isolated. We will admire the numerous mansions and stately houses of the 16th and 17th cent., as well as the parishes of San Pedro de Ariznoa and Santa Marina de Oxirondo. The monumental town of Oñati, known as the “Basque Toledo”, has some of the most representative Basque artworks, both civic and religious; the Universidad Sancti Spiritus and the Sanctuary of Arantzazu. In addition, in the Aizkorri-Aratz natural park, the area around Arantzazu is an ideal place to practice hiking and other sports in nature and to get to know different aspects of the history and ethnography of Euskal Herria. Small town, with around 260 inhabitants, located in the southwest point of Gipuzkoa. Emerged in the 14th cent. because of the economic interest of salt in the Middle Ages, its medieval structure that preserves five of its seven entry gateways and part of its wall. In addition it offers the visitor a succession of manors, palaces and stately buildings, among which stand out the Palaces of Garro, Elexalde, Ostatu and Során. Municipality with an outstanding industrial activity, which contrasts with a well cared for city centre and some small valleys sprinkled with groups of houses and communities. At the foot of the mountain Kurtzebarri, the Urkulu reservoir in the Aizkorri natural park constitute a setting of singular landscape beauty. Every year, Deba is visited by thousands of people attracted by the beauty of the landscape, the welcoming nature of its people and the varied cultural activities on offer. The town, situated at the mouth of the River Deba, has two beautiful beaches: one is known as Deba Beach and the other is called Lapari. Both have dark sand because of their proximity to the surrounding slate hills. The pleasures of the coast are combined with the chance to climb the gentle hills that surround Deba, from which incomparable panoramic views of the coast can be enjoyed. In addition, it is possible to take a pleasant stroll from the town centre itself to Santa Catalina or Aitzuri Point. Mallabia possesses a marked rural character. The town is surrounded by green fields and slopes which ascend to sizeable mountains; the large number of farmhouses dotting the countryside help make up the beautiful scenery, typical of the Basque Country. Numerous rural neighbourhoods exist in the surrounding area, accompanied by a host of chapels, many of which still welcome congregations made up of locals and visitors for the processions which are celebrated to commemorate festivities.Rural sports are one of the attractions of Mallabia: the ox-trials, stone-lifting, etc. are quite spectacular and particularly important during the festivities of the patron saint in August. A town of reduced dimensions if we look at the number of inhabitants; however, its magnificence can be appreciated in the beautiful scenery that surrounds the town. Several routes that start in Mendaro will delight mountaineers: Arno, Kanpazar, Urnobieta, Gaintxipixa, Otarre, etc. The Kilimón valley, at one end of which the town of Mendaro lies, is a karst valley. There are a large number of caves in the area which make the valley a real paradise for those who enjoy potholing. There are also several sites of archaeological interest to be visited. The river Kilimón, which gives the valley its name, and the Intxusai river, are beautiful tributaries. These are nice areas for walks, as there are wonderful waterfalls and rapids, such as those of Intxusai, and these are peaceful places for those who enjoy fishing. Mendaro is home to the “Chocolates de Mendaro-Saint-Girons” company, a family business devoted to the production of high quality handmade chocolate, made following a traditional recipe since 1850. A visit to this company is a pleasure, the sampling of its products even more so. A pleasant fishing village, whose inhabitants formerly took part in whaling activities. To this day, fishing and related industries are still fundamental economic activities. Mutriku is the birthplace of the eminent seamen Gaztañeta and Churruca, known throughout the world for contributions to shipbuilding, the former, and for his heroic performance in the Battle of Trafalgar, the latter. The Old Quarter of Mutriku is one of the best preserved in Gipuzkoa and the Basque Country as a whole. It is made up of two squares and narrow cobbled streets which link the whole village together down to the fishing port. In these charming streets of identifiable character we find palaces and houses of architectural interest that usher us along an unforgettable route: Galdona House, the Town Hall and the neo-classical church of Nuestra Señora de la Asunción, where a canvas by Zurbarán may be found. Argiñeta Necropolis:Is a set of graves and tombstones sandstone. The word “Argiñeta” means “place of beds.” Christian graves dating from the ninth century and were destined, probably leading magnates and nobles and Visigoths, those that from 711 Arabs were fleeing after the defeat of Guadalete. It consists of two rough-hewn pieces: the cover or lid, triangular, and the niche or sarcophagus, carved in the stone itself. They gathered in front of the chapel of St. Adrian in a horseshoe shape. Today there are 23, one double, for men and women. Among the tombs there are five trails discoid pre-Christian tombs much earlier than the arrival of Christianity and to these places. In the Plaza de Don Tello, attached to the palace of Arezpakotxaga, is the only site left in turreted walls primitives. This Gothic portal is 3 meters high and 2.50 wide. In the neighborhood of the same name about 100 m from the chapel of Santa Catalina, is the source of Inca origin, a replica of the original, built by the Magistrate in Peru Manuel de Berriozabaleta. The Vizcaya town Lekeitio is well known outside its territory by the uniqueness of some of the festivals that takes place as those of San Antolin or San Pedro. comprehensive architectural heritage of incalculable beauty. Within this the most significant buildings are as follows: The Basilica of the Assumption of Our Lady. National Monument is declared this building, the fifteenth century, which is Gothic. One size Marian XII century Gothic altarpiece and the sixteenth-century Flemish, which is one of the most beautiful in the whole province, are the two most valuable elements of the temple.Read shipyards: Set of craft shipyard for the construction and repair of wooden-hulled vessels at the mouth of the river. Kortezubi is a town which has preserved a heritage landscape, ecological and cultural development without parallel in the whole Biosphere Reserve Urdaibai. This municipality located in the middle estuary of Mundaka was chosen by our ancestors as a home and dwelling in prehistoric times, no doubt attracted by the abundance of resources and comfort of its numerous caves. They, our ancestors, masterfully recreated the life and spiritual concerns of the time. Located on the southern slope of Mount Ereñozarre, is the largest cave of ethnographic value of the Biosphere Reserve. Discovered in 1917, the excavation was carried out between 1918 and 1926, led by team-Eguren Arazandi-Barandiaran. The great interest shown by its geology and the quality of its archaeological yaciminetos joins the proliferation of the Magdalenian period cave paintings with representations of prehistoric fauna. Notable bison, horses, tents, a bovid, a boar, a brown bear and a deer head, a total of fifty figures. Made in the mid 1980’s by the artist Agustín Ibarrola basauritarra, try using one insignis pine as a canvas for an original work called “The Painted Forest.” The paintings are shared by trees that are located in different spatial frames, giving each thematic depth and a different movement. 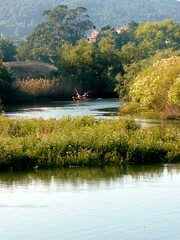 Basondo is a haven for threatened wildlife. 60,000 meters of meadows and forests are home to the main species of wildlife in the area: wild boar, deer, foxes, wild cats, genets, otters, birds of prey and migratory birds, and reptiles., Together with other species already are extinct in our environment, such as the wolf, the lynx and the European bison. In Basondo the visitor can see all the animals up close and photograph them. For more information on Basondo, access the official website . Meet weekly market Gernika, on Monday, buyers and sellers of agricultural products from the area and others, creating an atmosphere that day colorful and cheerful culminating basket parties Jai-Alai Fronton. The founding charter of the town, Count D. Tello, on April 28, 1366, grants the market is held one day a week. At first it was on Wednesday, arriving later to be daily, with permanent positions in the Azokekalea. 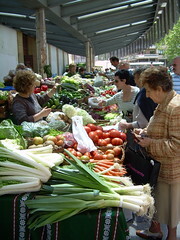 Over time, the quality and relevance of Gernika markets were rising, especially markets or annual fairs of cattle. The coincidence of interests that Gernika was definitely assimilated fairs and markets of the neighboring porches with the passing of time have given rise to the famous Monday of Gernika. With the harvested crop, the market grew larger with more participants, every Monday was a special market last summer but was met more people, even in Gipuzkoa and Araba to buy merchandise because that day was that marked the price for the entire year. The expansion of the town made the market moved to the fair. The Civil War halted this fair with democracy until the group “Ekin Talde” decided to take it up and drive again last Monday in October. Over the years will adquieriendo popularity and professionalism that day creating a lack of space to display all participating products. In 1983 it was decided to celebrate the first Monday in October with the exhibition of cattle, leaving the agricultural fair for the Last Monday, it’s like today is still performed.